Steam power and some of the classiest British motor cars will be boosting the IW synchronized skating teams on Sunday 31 July at the IW Jaguar Classic Car Show. Held at the IW Steam Railway, Havenstreet, the Jaguar Enthusiasts’ Club’s annual family fun day features an exhibition of classic cars, including some outstanding examples from the Jaguar marque, plus entertainments including live music, falconry and dog displays. The synchronized skating teams are the chosen beneficiaries of the IW branch of the Jaguar Enthusiasts’ Club’s fundraising activities for 2010-11. The annual family fun day at Havenstreet will therefore directly help the teams. The synchro teams will have a stall at the show, offering face painting and running games. Attending the event is also a fantastic way of celebrating the 50th birthday of the E-type Jaguar, probably the most beautiful British sports car ever made, and certainly a design icon. 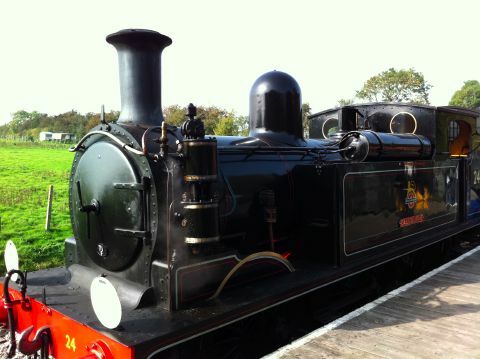 What’s more, the IW Steam Railway will be in operation on the day, with the opportunity to see the recently restored Adams O2 steam locomotive Calbourne, the only survivor of a class of engines that hauled trains on the IW railway system in the last years of steam. Admission to the rally is £4 for adults, free for accompanied children under 16. Travel on the steam railway is extra. The showground is open from 10am to 4pm. Visitors can park at Wootton and catch the steam railway to Havenstreet, rather than driving direct to Havenstreet – but check train times first.